On April 10, 2012, United States Army Staff Sergeant Travis Mills of the 82nd Airborne was critically injured during his third tour of duty in Afghanistan by an IED (improvised explosive device) while on patrol. Travis lost portions of both legs and both arms. He is one of only five quadruple amputees from the wars in Iraq and Afghanistan to survive his injuries. The remarkable story of Travis Mills has a deep and direct connection to the aftermarket parts industry. Travis’ courageous recovery was aided tremendously by the constant support and care provided by his father-in-law, Craig Buck. Craig is a long time member of the aftermarket parts community, having worked for many years in our industry for companies including TYG and Chambers Aftermarket. He was also an active member of the ABPA. When Travis returned to the U.S. following his injury, Craig left his job with TYG in Texas to provide full-time care for his hero son-in-law. 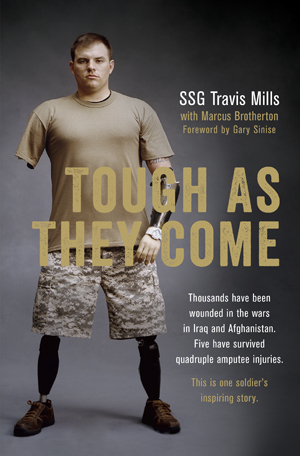 Travis wrote a best-selling book, “Tough as They Come,” and started the Travis Mills Foundation, a nonprofit organization, formed to benefit and assist wounded and injured veterans and their families. The foundation’s motto is, “Never give up. Never quit.” Travis and Craig travel the country making appearance and giving speeches in support of wounded veterans. Soon the incredible story of Travis Mills will be coming to the silver screen. A motion picture adaptation of Travis’ book is in the works, with Adam Driver set to portray Travis, and Sylvester Stallone on tap to portray Craig Buck. You can read more about the movie project here. This could have been a sad and tragic story. But, thanks to the bravery of Staff Sgt. Travis Mills, and the love and support of his wife, Kelsey, daughter and father-in-law Craig Buck, it is a story of determination, heroism and the strength to give back to others. We urge you to buy the book and support the Travis Mills Foundation, and we look forward to seeing the film when it premieres.